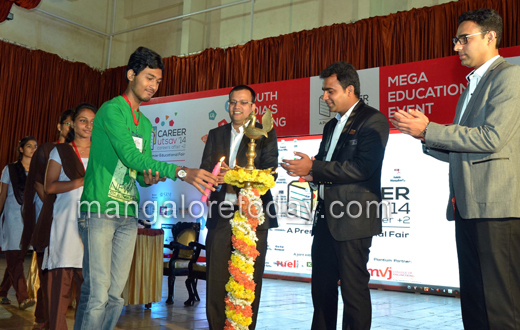 Mangaluru, Dec 21, 201: A two-day Career Utsav 2014 organised at the TMA Pai Convention Centre in the city under the aegis of Fuel Media Solutions Pvt Ltd, was inaugurated on December 20, Saturday by Varun Melanta, Director of MVJ College of Engineering. In his inaugural address, Melanta exhorted students to choose a career of their choice after consultations with their parents. There should be no regrets about the choice later on, he said. 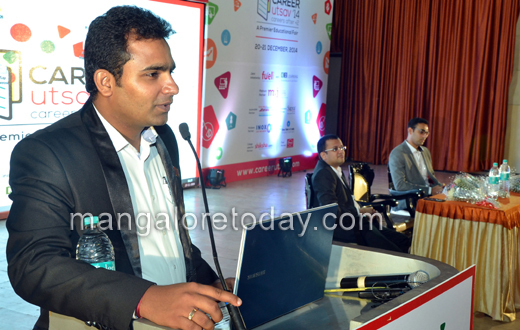 Pradeep Naik, Founder and CEO of Fuel Media Solutions who spoke on the occasion said Career Utsav of this kind is being organised for the first time in the city of Mangaluru and added his firm had organised similar events in Bengaluru since three years. Sripal Jain, Founder and CEO of K2 Learning also addressed the students. Several workshops and seminars on relevant topics including ‘All about overseas education’ and ‘New Age Engineering Careers’ are being held as part of the two day event. A mock CET test, psychometric tests, free counselling and scholarship tests are organised as part of the Utsav. Career guidance books will also be distributed to PUC students attending the Utsav. For the first time in Karnataka a 3D dirt biking show is also organised.